Just got home from the 1st day of the 15th Annual Full Frame Documentary Film Festival at the Carolina Theatre (and a few accompanying venues) in Downtown Durham. This year, Full Frame is paying tribute to noted filmmaker Stanley Nelson, who was there in person to introduce his 1999 documentary about the history of American black-owned and operated newspapers from 1827-the present. The anecdotes about papers like the Chicago Defender, and the California Eagle being where African-Americans turned to for news because they "didn't exist in the other papers," as interviewee former reported Vernon Jarrett puts it, pull the heartstrings and get in some humor too. Great doc to start the fest with. Next up, a couple of short docs: Nellie Kluz's YOUNG BIRD SEASON and NATION. I think I choose poorly for this time-slot. For some reason, I picked a 20 minute short about competitive pigeon racing, and a 66 minute one about an athlete (Jesus Navarro) training to dodge and leap bulls for sport. YOUNG BIRD SEASON which focused (maybe too kind a word) on a group of New England bird-racers was too slight and unwieldy (I can't really remember much about it except for some folksy banter and shots of mobs of pigeons being freed into the sky) to be much to write about, and NATION is well shot but deadly dull. Long (and I mean * long *) unbroken shots of Navarro running, jumping, and working out in the Catalonia countryside go on so tediously that people were walking out. The film picks up a little when Navarro enters the local arena, but a few more people still left. The next couple of shorts fared much better: Fiona Otway's KISS THE PAPER and Andrew Beck Grace's EATING ALABAMA. The first is a charming 20 min. short about letter press printer Alan Runfeldt, who owns and continues to run a number of old printing presses. The second, the hour-long EATING ALABAMA, concerns filmmaker Grace and his wife's plan to only eat only food grown by Alabama farmers for 1 year. Despite the Morgan Spurlock-esque gimmickry of the premise, the film is a sincere look at the challenge of eating locally, how dependent we are on the modern food industry, and its got a nice homage to the dream sequence ending of RAISING ARIZONA to boot. MARLEY (Dir. Kevin McDonald) Reggae superstar Bob Marley isn't a new subject for a documentary, but McDonald's film is the best I've seen yet, a vast improvement on Declan Lowney's 1992 biopic TIME WILL TELL. A lot of the same footage is in both, but MARLEY weaves together a much more intimate and absorbing portrait, especially in the huge amount of previously unseen photos and in the sad depiction of Marley's final months alive before succumbing to cancer at age 36 in 1981. Alright! Well, I better crash. 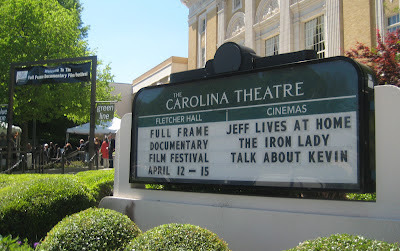 Stay tuned to this space for more coverage of Full Frame 2012.